Of course, Welby never answered the question, though he raised others. (What is the inequality in the proposed equal marriage legislation? What does he think about civil partnerships?) Admittedly, Rowan Williams was often incomprehensible, but he did tend to talk in complete sentences. The historic teaching of the church around the world, and this is where I remember that I’ve got 80 million people round the world who are Anglicans, not just the one million in this country, has been that marriage in the traditional sense is between a man and woman for life. This statement raises rather more serious questions as to whether the new Archbishop of Canterbury is quite up to speed. First, he should recognize that he is not the archbishop of the Anglican Communion. He is an archbishop of the Church of England and has authority only in that church. What he has with regard to the Anglican Communion is influence, not power, and, after the disastrous tenure of his predecessor, his office likely has even less of that than formerly. A more serious mistake is his citing of the 80 million and 1 million figures. I was unable to find reliable information regarding the number of Anglicans in the world, but some number between 75 and 80 million is usually cited. (Mark Harris took a stab at unpacking the number in a 2008 post. It surely is not “correct” now and wasn’t even in 2008, but the numbers are likely in the right ballpark.) Conventionally, the number of members of the Church of England is given as 25 million. (Mark uses this figure.) Everyone knows this number is a fiction, a product of the entire population’s being counted, at least by default, as members of England’s established church. 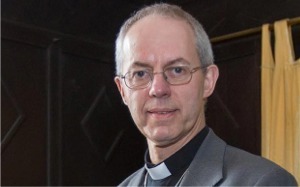 Welby’s 1 million figure is closer to the number of people attending Church of England services each Sunday. This figure comes nearer to stating the real number of Anglicans in England, though it is a bit of an under-count. The problem, of course, is that the mythical 25 million figure makes the largest contribution to the 80 million figure. In other words, if Welby thinks there are 1 million Anglicans in England, there surely are no more than 56 million Anglicans worldwide. Being generous, let’s say there are 4 million actual Anglicans in England. This would make—again, generously speaking—59 million Anglicans everywhere. In other words, what Justin Welby had to say about marriage equity was simply an incoherent, ill-informed mess. I hope we may expect more clear thinking from him in the future.